You will feel the difference with improved health, increased energy, reduced bloating, and normalized bowel activity. 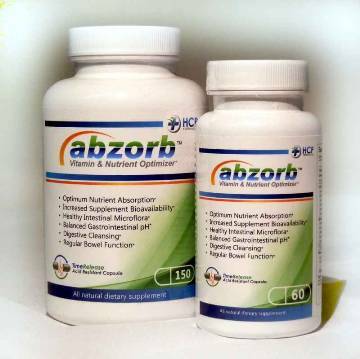 Abzorb can improve absorption for everyone and is a must for anybody looking to begin a healthier lifestyle with a new proper diet and supplement regimen. Serving Size: Adults take 2 capsules once daily with water' preferably on an empty stomach. Your healthcare provider may also recommend an activation dosage of 2 capsules' twice daily for the first two weeks. Other Ingredients: Cellulose (vegetable capsules)' rice extract. This product contains no Phthalates' talc' artificial colors' artificial flavors' titanium dioxide' fish' dairy' wheat' yeast' gluten.